Take a seat! With just a few materials and a little bit of time, you can make this stylish, industrial-chic stool that can come to the rescue whenever you need an extra perch. 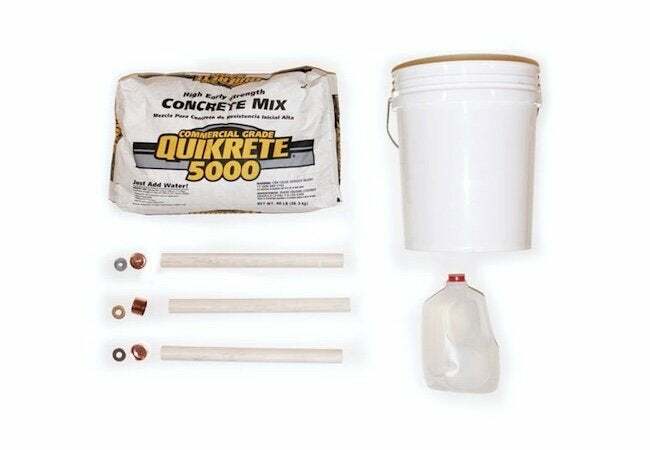 concrete mix. 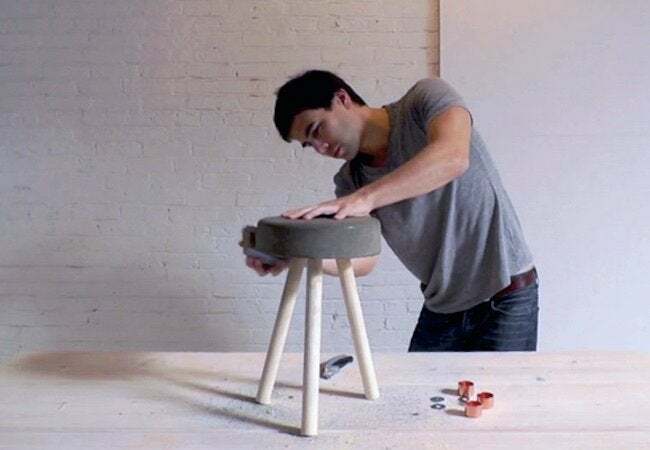 Easy to make and appealing in its pared-down look, the so-called bucket stool offers a wonderful introduction to the process of working with concrete. Perhaps best of all, it’s going to cost you only about $5! 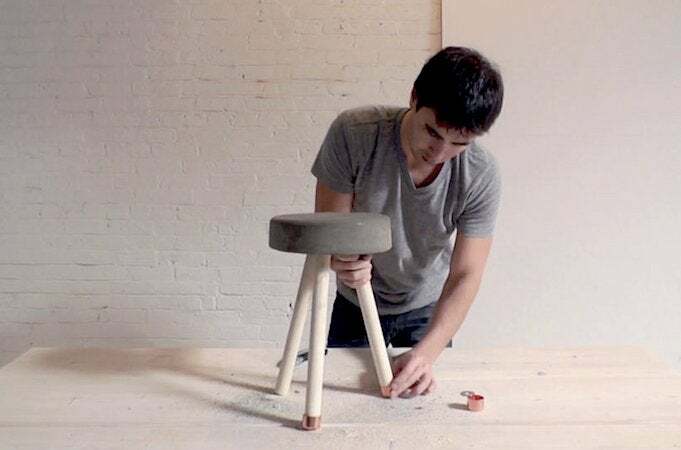 Begin your concrete stool by preparing its three legs. Starting by cutting the 48-inch-long wooden dowel (available at your local hardware store or home center) into three equal 16-inch lengths. 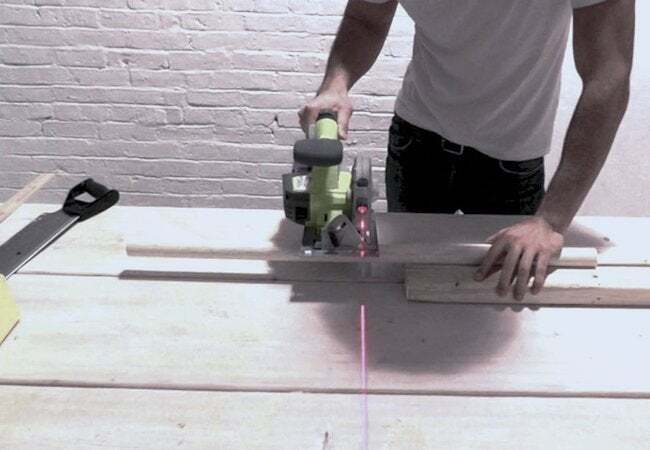 To make the cuts, use whatever type of saw you feel the most comfortable with; it doesn’t need to be a power tool like the circular saw shown in the photo. Be aware that the diameter of the dowel determines, to a large extent, the sturdiness of the stool. These instructions specify a dowel with a one-and-a quarter-inch diameter. While you can work with a dowel that’s wider, it’s best not to cut your legs from a dowel that’s any narrower than one inch. That said, if you find an old broomstick or rake handle whose diameter fits the bill, you may be able to save a little money and the hassle of a trip to the store.
. Next, add some water and thoroughly combine the two. Be careful not to use too much water. Doing so may result in weak concrete with a tendency to crumble. 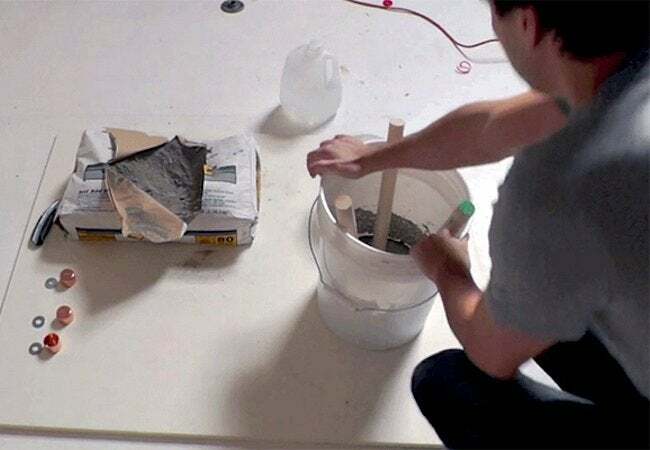 Mix the wet concrete until it takes on the consistency of cookie dough. Once you’ve mixed the concrete to the appropriate consistency, it’s important to dislodge the air bubbles suspended within the material. There’s an easy way to do this: Simply shake the bucket from side to side and repeatedly tap the exterior with either your hands or a hammer. When the concrete, now free of air bubbles, has settled, you’re ready to set in the stool legs. Stick each leg about an inch and a half into the concrete, letting its opposite end rest against the bucket. Pay attention to placement. Don’t place the legs close together; instead, try to place them equidistant apart. Once the legs are in position, wait about a full day for the concrete to dry. When the concrete has cured, you can move on to the “unveiling”—that is, taking the virtually complete stool out of the bucket. To do so, bend the sides of the bucket outward in all directions, gently detaching the concrete from the form. Next, pull the stool out by the legs—it should come out easily, but if you run into trouble, you can always cut away the plastic. 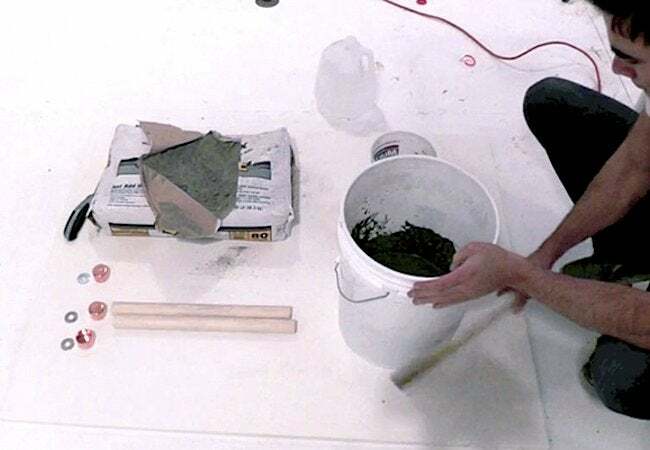 Inspect the concrete seat and, if desired, smooth any rough edges with 120-grit sandpaper (at this point, the concrete still ought to be easily workable). Finally, address the legs. If your stool came out a bit wobbly, or if you’d simply like to add some decorative flair, then go ahead and attach washers and copper pipe caps to the ends of the legs. To keep those caps from moving, you may opt to secure them in place with construction adhesive, but it’s not strictly necessary. Before capping the legs, you may also consider painting, staining, or dip-dyeing the legs with semi-gloss house paint in your favorite color.